Has your favorite pairing not been getting enough love? Do you want a chance to prove that these two characters are really meant to be? 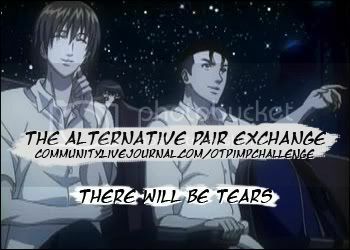 The OTPimp Challenge is an exchange of alternative pairs. It offers the opportunity to write about that pairing you know everyone else will just love if only it were given a second look. So, are you ready to explore the possibilities? Who needs drabbles and oneshots when you can have a single line that says it all? Browse through the sidebar, pick your fandom, pairing, and get writing! Remember, all it takes is one sentence. It'd be awesome if you tried your hand at both. :) You can contact sickletongue (for 1sentencepr0n) if you'd like to take up any fandom which isn't listed in the sidebar. I'm already looking forward to the entries (and want to be home for the 1sentencepr0n ones, they being nsfw and all). I hope you do! :D I already said so earlier but I do want to see you write more. <3 I'm trying to decide whether to sign up or not myself. I'm probably gonna cave though. I'll totally be your cheerleader if you do. :D It's a chance to play with weird pairings. I love weird pairings. I'd totally be your cheerleader, too! <3 And yes, weird pairings, pairings that need more love! !